There are several tea houses that serve boba in Riverside, but one of the newest tea houses, Ding Tea, is seeking to serve high-quality Taiwanese tea in a college-friendly environment. Ding Tea is a franchise from Taichung, Taiwan, with three locations in Southern California. In December 2018, the doors to its Riverside location opened, yielding a large crowd from neighboring colleges. At first glance it is easy to overlook Ding Tea as it is burrowed between buildings on University Avenue. 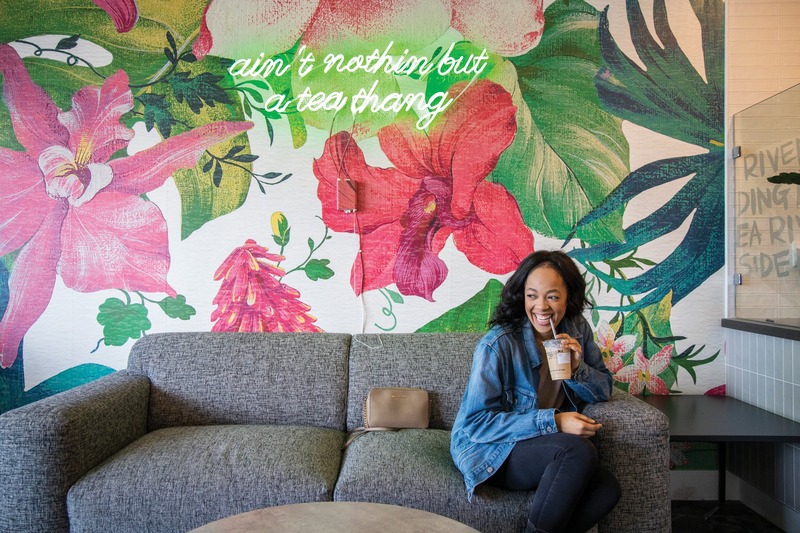 However, the inside of the tea house offers a warm and simple aesthetic with floral-decorated walls, comfortable seating and a neon sign that spells out “ain’t nothing but a tea thang” — a pun on the classic rap single. According to Nghi Trang, owner of Ding Tea, what separates Ding Tea from other tea houses is the quality of tea they serve and its distinct flavor. Apart from its distinct flavor, the tea house’s aesthetic sets it apart from others. During the construction of Ding Tea’s Riverside location, Trang said the atmosphere is something that he had in mind to attract the younger crowd. “I wanted a place that is hip and has a very college-friendly vibe where people can come in to study or hang out with friends,” Trang said. Many are surprised by the comfortable atmosphere Ding Tea offers its visitors. Zara Hurtado, University of California, Riverside, graduate student, visited the boba house for the first time and said she enjoyed the restaurant’s accommodations while drinking her mango black tea. “I was surprised at how trendy Ding Tea is, given that it’s such a hole-in-the-wall spot that you don’t even notice from the side of the street. Their aesthetic and table games are what make it worth coming back,” Hurtado said. While customers wait for their orders, they are free to use some of the board and card games at their tables. Ke’Aira Wikes, junior communication studies major at California Baptist University, has visited the restaurant twice and said she was surprised by the crowd that the tea house attracted. Ding Tea is open every day from 11:30 a.m. to 11 p.m. and is located at 1575 University Ave #E, in downtown Riverside.